On January 8, 2018 Jalen Hurts, the starting quarterback at the University of Alabama, had his entire world shook. 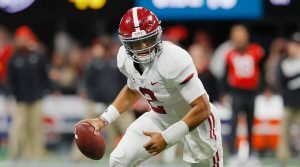 He struggled in the first half of the College Football National Championship game and the Alabama Crimson Tide went into halftime losing to the Georgia Bulldogs. It was in the locker room, losing 13-0, that Hurts learned the news that he would be watching the remainder of the game from the sidelines. It didn’t matter that Hurts had brought the team back in the past. His nearly unblemished record couldn’t get more faith bestowed upon him. Instead, he was left to watch as freshman Tua Tagovailoa led the Tide to a comeback victory, and a National Championship. Hurts found himself in a lose/lose situation. If Alabama would’ve lost, he would be blamed regardless of how Tua played. When they won, it took mere seconds for the world to proclaim Tua as the starter coming into this season. It took Alabama head coach Nick Saban much longer, dragging the decision into the season and almost ensuring that Hurts would be stuck playing backup. This is where the story diverges from most. 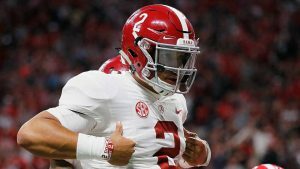 Instead of doing the logical thing and sitting out to preserve his redshirt, a move which would allow him to graduate from Alabama and transfer to another school with two years to play, he announced that he would play this season. He was quiet while Tua balled out. He was quiet while Tua catapulted to the top of the Heisman watch. He was quiet as onlookers bestowed this Alabama team Floyd Mayweather status (The Best Ever). He was quiet as critics took subtle shots at his play. “Tua unlocks the talent of these receivers.” “Tua gets all of these playmakers the ball.” Through it all, Hurts remained silent. But he was also quietly working on his craft. In his limited opportunities to play this season, despite blowing many teams out, he quietly completed 74% of his passes for almost 700 yards and seven touchdowns. He quietly continued to take care of the ball. He also quietly got himself healthy. We could see Tua had some kinks in the armor. Struggled vs pressure against Mississippi State. Struggled with health. He’s not built to take as much abuse as Hurts, and his lower body was feeling the affects. The SEC Championship was the convergence of all those things, and through three quarters, Tua not only looked like anything but a Heisman candidate, he injured his ankle when a lineman was push back and stepped on him. Suddenly, in the same building where Hurts’ head coach lost faith in him, facing the same team who made that coach feel as if he had to go in a different direction, he had an opportunity. Not for redemption. Two national championship births and SEC offensive player of the year spoke load enough about his ability as a quarterback and as a leader. Hurts had a chance to show that he would not only be a factor in this game, but the nation should be on the lookout for him next year. Of course he tied the game on a touchdown pass to WR Jerry Jeudy and then won it on a signature Jalen Hurts run. In the process he made CBS color commentator Gary Danielson eat crow when he referred to Hurts as a “run first” quarterback. He was 7-9 for 82 yards and that Jeudy touchdown throw, converting critical 3rd downs in the process as well. The question now isn’t about who plays in the playoffs. The question becomes where will Hurts be this time next year. He can’t spend another year like this. And now that every team in the nation has been reminded that he can handle a top SEC defense, what is the next logical move? What will be the final chapter in this epic college football story? The best scenario is if Hurts calls up Gus Malzahn at rival Auburn and tells him to dust off that Cam Newton playbook for another run. He’s been the reason that Bama has continued their supremacy why not be the reason it comes to an end?